Becky James says she is fit and ready after recovering from injury and illness. James, 24, is back in the Great Britain world track cycling championship team for the first time in two years and aiming for a place in the Rio Olympics. It follows a long battle with a knee injury which sidelined the 2013 double World Champion for 24 months. "There is no problems with the knee at all, so happy days. I'm really excited," she said. "It's such a big opportunity for me to be back in the team and I'm really excited to be racing again." In May 2014, she had an operation to remove abnormal cells following a cervical screening, which could have developed into cancer if left untreated. She has also suffering from knee and shoulder injuries. 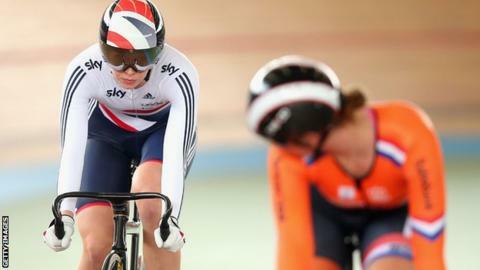 James made her return to the British vest in January, but did not make the podium at the World Track Cup in Hong Kong. However, she says her fitness has improved since then, and with it her confidence ahead of the World Championships in London on 2-6 March where James will compete in the keirin. "I've moved on a lot," she added. "A massive part is knuckling down and having a bit more confidence in my ability. I'm a completely different person to three months ago. "I'm happy and when I'm happy I get the most out of my performance. Being positive and happy about things. It shows in my times with that positive mental attitude." If GB qualify to enter a sprint team at the Rio Olympics, there will be two places available with James in competition with Jess Varnish, Katy Marchant and Shanaze Reade for selection.